There's no better way to travel than with Hide & Drink's hand cut, hand sewn and hand crafted Travel Wallet. With enough room to hold your passport, your credit cards, cash and other small items, go the extra mile with this elegant, full grain leather Travel Wallet. With ample space, but thin in design, it holds everything you need and comfortably fits in your pocket without being bulky and cumbersome. Measuring 8.25 inches wide by 5.35 inches tall when open, and 4 inches wide by 5.35 inches tall when closed it fits any Passport. HANDMADE FROM SOFT & ATTRACTIVE FULL GRAIN LEATHER: Hide & Drink's Travel Wallet is hand cut and handcrafted using the highest quality of leather that you will find, namely Full Grain Leather. We don't use any of that low-quality, flimsy PU leather. You get what you pay for with Hide & Drink; the high-quality of our leather ensures a long lasting life and durability. After time and use, the leather will attain a beautiful and unique patina, growing gracefully with age on your travels. ATTRACTIVE VINTAGE STYLE FOR ANY PASSPORT: Travel with style and class with Hide & Drink's Full Grain Leather Travel Wallet, made in a classic, vintage design. Snugly holds your passport, but is easy to remove when you reach passport control. 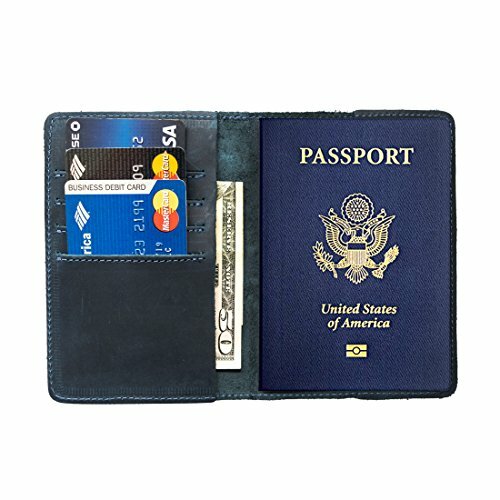 ROOM FOR CARDS, BILLS AND FLIGHT TICKETS: The Travel Wallet boasts enough space for not just your passport, but for credit and debit cards, cash and your luggage ticket stubs, too. Furthermore, while it can pack a lot, it's also thin and lightweight enough to fit in your pocket with ease and comfort. FINELY STITCHED AND FIREBRANDED: Hide & Drink's Travel Wallet is handcrafted by expert artisans of Pastores, Guatemala. Finely stitched with strong, durable nylon base thread, any loose ends are passed over an open flame to prevent any unravelling during its lifetime. The Travel Wallet is also fire branded with Hide & Drink's mascot Owl, an omen of good luck according to Guatemalan legend. MAKES A UNIQUE & UNFORGETTABLE GIFT: This makes a fantastic gift for your loved one who loves to travel and does so in style. A great gift idea for birthdays, Christmas, anniversaries and so many more occasions, this Travel Wallet makes an unforgettable and thoughtful gift for anyone and everyone.